Saturday December 7th 1901 I got my work done this morning. I answered both the letters I got last night. Will went to town in the morning. The Warners were here to visit by invitation. I got my supper early and knit in the evening. Dell's brother here to stay all night. Sunday December 8th 1901 The boys went to town in the forenoon. I was busy most of the morning, read some. In the afternoon I wrote a letter to Lizzie Lindley Mollie came back before supper. Monday December 9th 1901 I churned this morning and Will helped me work. Jist as I finished my dinner work Mother and Clara Shultz came. weather nice. It was three years today since Edith died. Tuesday December 10th 1901 It was cloudy and snowed some. so I brought the cloths from the line. I knit when not busy with the work. I had expected to go down home. 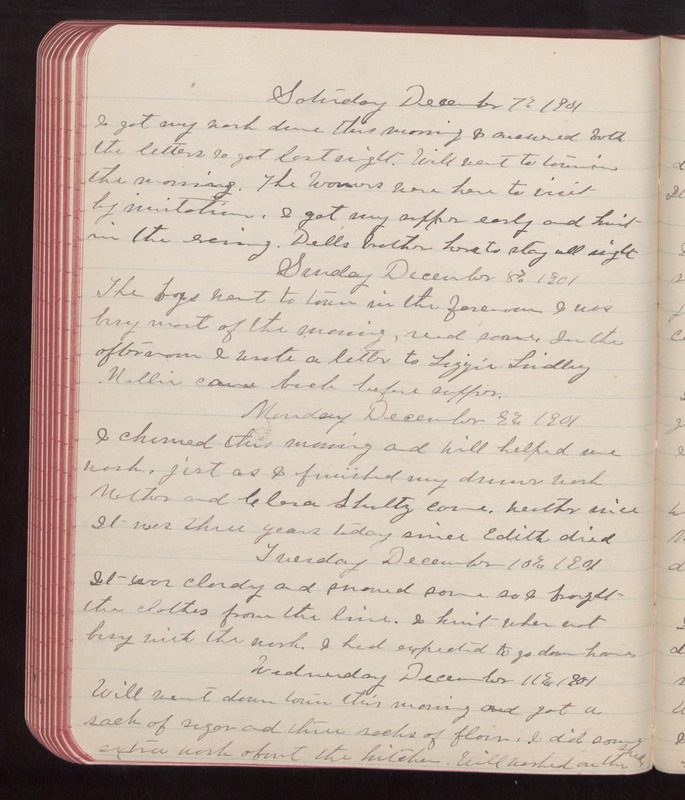 Wednesday December 11th 1901 Will went down town this morning and got a sack of sugar and three sacks of flour. I did some extra work about the kitchen. Will worked on the shed.